You are a mother and your two year old daughter Nyakuoth Lam Tut Has fallen onto a cooking fire and sustained 15% burns on her head and back. The little girl needs urgent medical attention. It would be bad enough if you lived in a remote area of this country but in fact you live in a really remote area of southern Sudan where because of the civil war between North and South things are very dangerous indeed. How are you going to get your child to hospital so very far away? Fortunately a small plane had flown some urgently required medical kits into the area for the charity MEDAIR and was on its way back to its base at Lokichoggio in the far North of Kenya. It is diverted and picks up you and your daughter and flies you to a well equipped hospital there for treatment. 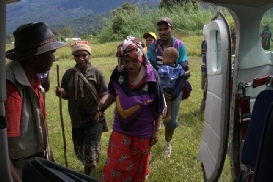 The aircraft was operated by MAF ( Mission Aviation Fellowship) and this was just one of the rescue flights it makes week in a week out in some of the most inhospitable terrain in the continent of Africa. MAF is a Christian agency whose mission is to fly light aircraft in developing countries so that people in remote areas can receive the help they need. Every 3 minutes a MAF plane is taking off or landing somewhere in the world. These flights enable crucial work by many development and aid agencies, missions, local churches and other national groups. Medical care, adequate food, clean water and Christian hope are reaching countless thousand men, women and children. In 1944.1 man. Murray Kendon N.Z pilot RAF Coastal command. That meant long flights. Time to think!! Had man learned to fly for conflict only?? People living impoverished & fear ridden lives in isolated places – mountains – deserts – jungles – swamps could be reached by air. Planes could be used to bring them help & hope & show them God’s love. He approached Dr Thomas Cochrane head of The Mildmay Movement which sort to encourage fresh initiatives in Christian outreach ( Cochrane was an ex pioneer medical missionary in China). Murray was convinced that Missions should not take on aviation as a sideline! That would be neither efficient nor safe! No it was a job for specialists. Murray’s plans were to be discharged, get married, go home to NZ and continue in some form of Christian work. He struggled! He Thought! He Prayed! God had given him the vision but also the call to m ake it happen. Soon afterwards a 26 year old RAF engineer Stuart King read an article about MAF in the Mildway magazine called ‘Outlook’. He wrote offering advice. Stuart had been offered one of the precious few permanent commissions in the peacetime RAF and a chance to study at the brand new Cranfield College of Aeronautics. His dream come true!! But others urged him to follow his dream”. He made 3 attempts to make the phone call needed to accept his commission. But couldn’t shake off the feeling that was not the right thing for him to do. Read Paul’s letter to the Hebrews Chapter 11. “ By faith Abraham went out not knowing where he was going”. His decision was made. Stuart found out later that in the MAF office they had been praying hard for months. 2 weeks became 2 months, 2 months became 2 years. Jack became an indispensable part of the infant MAF. First survey 1948 small 4 seater Miles Gemini ended in a crash . (Gemini the twin stars Castor and Pollux) Not surprisingly Murray and Stuart became known as heavenly twins. First air service 1949 – 1953 in Sudan operated by a single de Haviland Rapide bought with the insurance money from the Gemini. Money was very tight and when Dr Cochrane gave the ‘go ahead’ it was with the proviso that they might have to sell the Rapide at any time.----They never had to!! 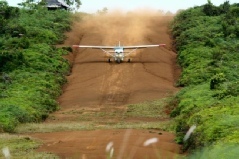 And now every 3 minutes somewhere in the world a MAF aircraft is taking off or landing.